The past two month have shown growth both in the Vogan Churches and out in the villages. We rejoice that 7 people were recently baptized in the Vo Asso Church and that 10 people were baptized in the Vogan Church. 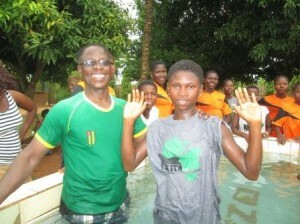 We are also planning for 9 more baptisms in the Kpeyidji area this coming week. We are thankful for the team that helps us go out to continue to build up the Churches in these areas including Hammer, Papa Koffi, Felix, Enoch, Wilson, and Isaiah. Many hands help us to reach many people and we are thankful for those who help us to teach others about Christ. We are also making plans towards creating a meeting place in Gnitaveglo area. The lot has been cleared by the local people and next we will begin with placing logs for a small structure for the meeting place. Praise God for the family of Christ working together. Thank you so much for all of you who are praying for the people of Totshoani. Your prayers are felt and are moving hearts. There truly is a spiritual battle going on in the hearts of the people there. Gruitzki, the idol priest in whose home we have meeting, is definitely at war within himself. There have been times where he seems so close to surrendering to the truth of Christ, but then you can almost see the spiritual battle of Satan pulling him back into the idol practices. For weeks he has been asking deep questions regarding Christ’s power and what it means to be a Christian and turn from idols. Please continue to pray for him. He has been avoiding the Bible studies the past few weeks, making excuses and running off saying he has to perform different ceremonies for people. He even has been a bit confrontational to Dovene and one of the guys in simple Church training, saying that he doesn’t know what power they have but he wants it (The way this is being said is not in an earnest desire to know Christ, but appears more a general desire for power, almost like Simon the Sorcerer in the Bible). He is not pleased that his fourteen year old son is participating in Bible studies now and has been pulling him back some as often fathers pass on their idol priest “trade” from father to son. However, God is still at work in this village. Gruitzki’s brother Tagan and Mensa (one of the men who has also been going through the simple Church leader’s training) are both earnestly desiring to learn what it means to become a Christian. 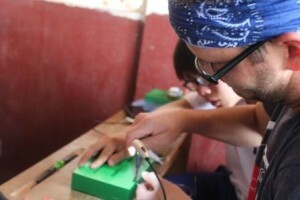 They have expressed desire to learn and study more so that they can be Christ’s follower. Dovene has begun a deeper study with these two and we are praying that through it they will surrender fully to Christ. For the time being as Gruitzki is not acting as a “person of peace” who normally would welcome us and encourage others to join and discuss the Bible, we have spoken with Tagan and have started meeting in his home. Tagan is open and welcoming for us to continue there. Please pray for our continued relationships with both Tagan and Gruitzki, that the Lord would move through them. We are thankful for how God is moving though the farm initiative. People always say the beginning is never easy, and that has definitely been true here. 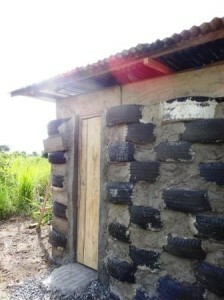 Projects are often complicated with transportation issues, difficulty finding competent help, additional expenses, and just general third world related problems. However God really does seem to be making a way for us. How he puts the right people in our path at the right time, how He provides at exactly the right moment, and how he works to help us find the right people to work with. We continually pray that God will give us more wisdom and discernment each day in not just this work but in everything. 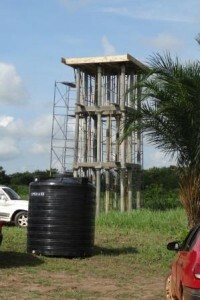 The latest elements at the farm have been building a water tower to pump the water from the well to and getting it hooked up with waterlines. Also installing solar panels to run the pump and supply some minimal lighting and ability to charge phones in our small building on the farm. These tasks have seemed monumental at times for what should in a lot of places be very simple but we are thankful for the Lord continuing to walk with us. We have also been working clear out the bush, clear a farm path, and plant several types of trees on the farm this year. We were very blessed to be able to host a team from Texas this past June. We had an awesome group of 17 people who came to help in many areas of ministry. One of their larger focuses was running a free eye clinic that reached out to the local communities, villages, and nearby towns. We were just amazed at how Dr. Clay and a faithful team of helpers worked to see so many patients. In just 6 ½ days of clinic they were able to see 714 patients! Many received glasses on the spot and several will return to receive their glasses this coming month. This was an incredible need in our community and we were so thankful for the grace that was given to us all to try to work with the masses to get as many patients seen as possible during their trip. 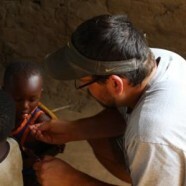 We are thankful for how this outreach enabled us to shower God’s love on the Togolese people. 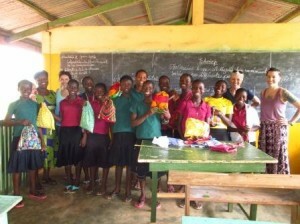 This trip also introduced our ministry to the “Days for Girls” program. We had two ladies (Linda and Candsis) who came and helped teach our local seamstresses how to sew kits that girls can use for feminine hygiene. Many girls miss school days or use inappropriate materials that can lead to infections during their menses and this program allows us to make kits for them to use so that they can stay in school and have a better chance in education. While distributing the kits Candsis, Linda, and Vanessa also shared encouraging words to the girls about their worth in Christ and to push on in life and education despite the obstacles that may arise. They were able to distribute in both our school and out in the village of Asso, and left behind kits that we will be able to use in more villages in addition to the ones that our now trained seamstresses will be producing. What a blessing and what a unique way to share God’s love. This trip was also filled with lots of other activities including some brave souls who went out to work on the farm with Dovene , helping us in the medical clinic, VBS in villages (some where we have started outreach, and others in new areas close to the farm), and encouraging the local believers both here in Vogan and in surrounding villages. We also enjoyed taking them up to Kpalime for them to experience some “cooler” mountain air in Togo and a few local sights. We are so thankful for this group and their servant hearts. They were a group willing to go, willing to serve, and willing to jump in wherever needed. Tagan and Mensa who are wanting to take the next step in becoming a Christ follower. 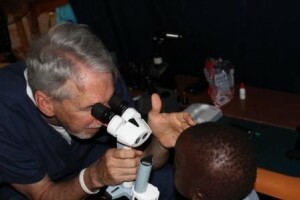 714 people seen in eye clinics in our community, a huge need served and God’s love shared. Our local workers who are here with us everyday working hard to see Christ shine to the Togolese. Pray that our village Church leaders would unite in the Family of Christ Churches. In our annual and quarterly seminars pray that we will be able to have one mind to be able to focus on sharing Christ. We are excited to host a team from Seymour Heights Christian Church (Seymour, Tennessee) this coming July. They will be helping us serve in village and community outreaches, distributing glasses that will be sent back by Texas group, and much more. For Gruitzki to submit fully to the power of Christ. For Mensa and Tagan to continue faithfully so that they may devote themselves fully to the Lord as they study what it means to be Christ’s follower. Our students who are awaiting their final exam results and will be on break for summer shortly. May God watch over them and guide them over the summer months. 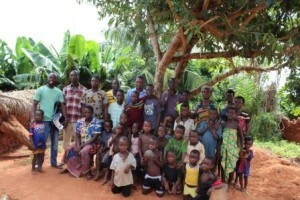 To financially support Togo Christian Mission please click here. To request to receive monthly newsletters with prayer requests via email click here.